A fusion of Arts & Crafts and Asian design, the Berkeley Bedroom Collection is both sophisticated and practical. 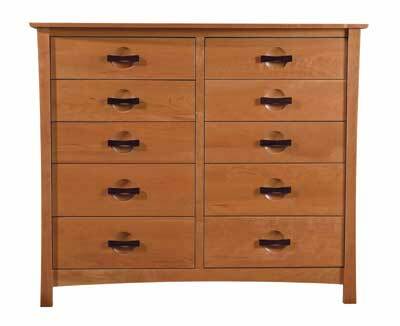 The 10 Drawer Dresser offers tons of great storage space. You can also choose to have open shelves instead of the two top drawers to store components for a TV. Crafted in solid cherry hardwood with American black walnut accents, this collection features a variety of case pieces and bed frames. Both the Berkeley 10 Drawer Dresser and the Berkeley 8 Drawer Dresser + TV Organizer are the same dimensions. The only difference is two fewer drawers at the top of the 8 Drawer Dresser where TV components or even knick-knacks could be stored.